The scene of the accident on State Route 203 Monday afternoon. Troopers said the car hit the tree, rotated 180 degrees and landed in the soybean field. Troopers added the body of Seth DeLong was found about 75 feet away from the crash, in water that was knee-deep on firefighters. A Delaware woman was still in the hospital Monday afternoon following a crash early Saturday that left three others dead, including two of her children. Meanwhile, state troopers continue to investigate why the body of one of the victims was not discovered until nearly 10 hours after the crash. The crash occurred at 12:47 a.m. Saturday when a 1997 Toyota Camry, driven by Darthel Jones, 25, of Delaware, failed to negotiate a turn on State Route 203 just south of Norton Road in Radnor Township. According to troopers, Jones lost control of the car, slid off the road and hit a large tree. Troopers said the car rotated 180 degrees and came to rest in a flooded soybean field. Jones was pronounced dead at the scene, as was a passenger, Trent Curran, 13, also of Delaware. Initial reports indicated that Jones and Curran were the only fatalities. A passenger in the vehicle, Kristen DeLong, 35, of Delaware, was flown by MedFlight to OSU Wexner Medical Center in Columbus with serious injuries. OSU Wexner staff confirmed DeLong was in the intensive care unit Monday afternoon but would not provide a condition. Curran, 13, a student at Dempsey Middle School, was DeLong’s son. He was in the right rear seat and was also pronounced dead at the scene, troopers report. The body of DeLong’s older son, Seth DeLong, 14, also a Dempsey student, was later discovered about 10:30 a.m. Saturday, troopers said. Ohio State Highway Patrol Lt. Kevin Knapp said that, during the initial investigation at the scene, firefighters did a preliminary search of the area for any additional victims but found no one. Knapp said troopers contacted friends of the victims about 5 a.m., and they identified Curran, who was carrying no form of identification. The friends were unsure if Seth DeLong had been with his mother and brother or if he had been staying the night elsewhere. Knapp said a curious trooper returned to the scene around 7 a.m. and searched again but found nothing. Knapp said that when another search occurred at 8:30 a.m., there was still no reason to believe there had been a fourth occupant in the car. However, Knapp said that, after troopers spoke to Kristen DeLong’s mother and learned that Seth DeLong had been with his mother the night before, troopers and firefighters returned to the scene at about 10:30 a.m. to search again. Seth DeLong’s body was found in knee-deep water approximately 75 feet away from the crash site about 10:30 a.m. The patrol issued a press release Saturday morning, stating that only two people had been killed in the crash. Troopers confirmed Sunday afternoon that a third person had been killed but declined to provide details at that time. The principals of Willis Intermediate School and Dempsey Middle School sent an email to students’ parents Monday, advising them of the situation and adding that counselors would be available for students Monday afternoon and Tuesday morning at Dempsey. Troopers reported they believe alcohol was a factor in the crash and do not believe high water played a part. Troopers said there were skid marks at the scene, ruling out the possibility of water covering the road. Delaware Municipal Court records indicate that Darthel Jones was ordered to pay a fine in March 2010 after being arrested for and convicted of OVI. Jones was also convicted for the purchase and consumption of alcohol six times before he turned 21. 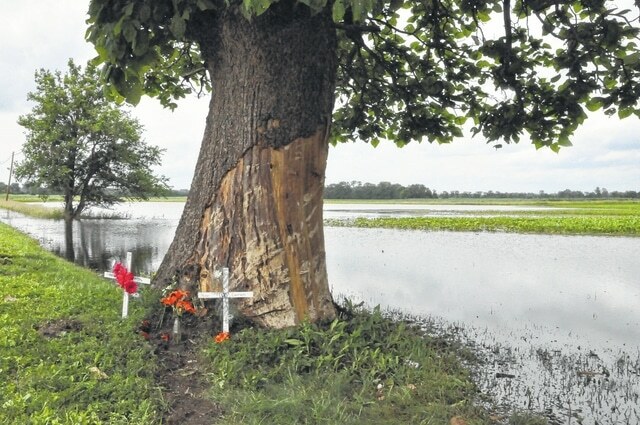 Officials from the Delaware General Health District said the last car crash in Delaware County that claimed three lives occurred in January 2014 on State Route 229.